Full sun to mostly sunny. [24" tall x 12" wide]. USDA Hardiness Zones 4-9. 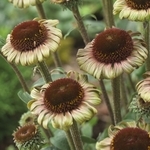 Echinacea purpurea 'Caribbean Green' PPAF. A rare new European introduction with unusual color and form. Beauty is in the eye of the beholder, right? We have limited quantities of this collectable. Completely unique from all other coneflowers by its color & petal shape.